Ted is a children's picture book, written and illustrated by Leila Rudge, and published by Walker Books, (2013). A story about finding your perfect place. Ted is a smart dog, with his own jumper. But he has lived at the pet store for as long as he can remember and nobody seems to notice him. Will Ted ever find the perfect place to live? 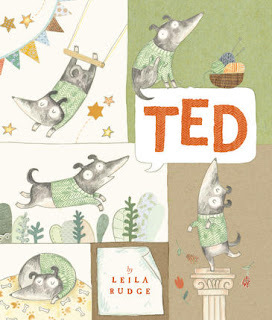 Ted is one of those delightful children's picture books that's as much about story as it is a feast for our eyes. Kids will feel for Ted, the smart dog with his own jumper. Maybe they even know a little dog who wears a jumper to keep him warm? They'll understand Ted's need for attention, and desire for somewhere he can feel loved and at home. At heart, Ted is a feel-good story about friendship and acceptance. Leila Rudge is an amazing illustrator. Her sketches are child-like, yet incredibly sophisticated. But don't take my word for it, find yourself a copy of Ted soon. Kids will love the detail, especially Rudge's use of pattern, and will pore over each page. They'll appreciate the quirky humour too. Be sure to point out the end papers, and discuss their significance with your kids. I love that Walker Books have added value to this beautiful children's picture book with excellent Classroom Ideas. If you're a parent, take advantage of these free-to-download activities that will help you and your child get even more from Ted. My book reviewing head would not at all be surprised if Ted were to win an award or three! The sketches are child like. How are they sophisticated? Do you mean in the settings they are portrayed? I mean it takes a great deal of artistic skill to come across as childlike so convincingly. The detail, especially the use of pattern and the careful choice of colour, the expressions on character faces and the use of subtle body language all contribute to my belief that Rudge's work is sophisticated.